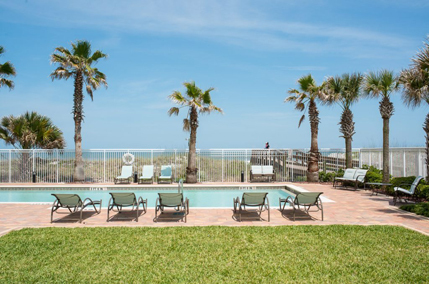 Costa Verano is one of our favorite high rise buildings in Jacksonville Beach. It is top of the line Jacksonville Beach real estate. It is a 13 floor 100 unit building with 2, 3 and 4 bedroom units and floor plans going up to over 4000 square feet. Jayne lived in Costa Verano for seven years, and she knows just about everything you could ever want to know about it. All units feel very solid and quiet due to the concrete block construction. There are two building towers and both towers have ocean views, with those on the back of the building having a direct view of the action. Off the balconies, you’ll see loads of kitesurfers and windsurfers. Something is just right about the winds and waves out there. The building is filled with incredible amenities: pool, spa, sauna, steam room, fire pit, outdoor grills, media room, billiards room, and private guest suites. There are also banquet sized rooms for use by residents. Costa Verano was built in 2006 by Auchter and WCI was the developer.